According to a legend, this exquisite Russian cuisine pie was frequent treat at the Tsvetayevy sisters' dinners. When I made it the first time I was delighted with its taste. All recipes say that the taste of the cake is really better when it's cool. My advice - try both! Mix butter, sour cream (yogurt), flour and baking soda. Knead the dough and put into the refrigerator while preparing cream. Mix flour, sugar, an egg and sour cream. Beat with a mixer or a whisk. Grease the baking dish with butter and put the dough. Hand stretch the dough in the dish, making kind of a basket. Peel the apples, cut into thin slices, put into the dough basket. Cover apples with the cream. 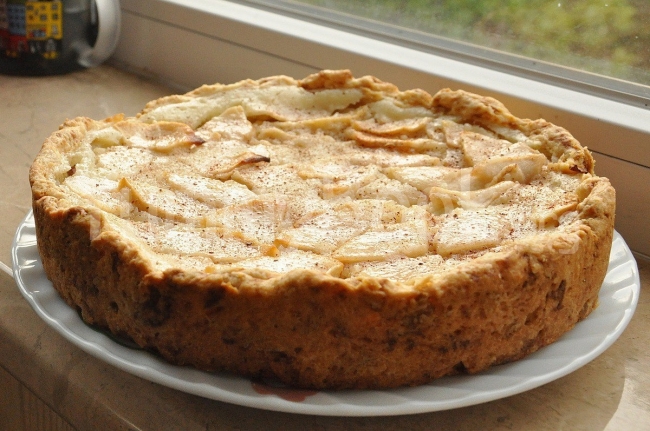 Bake the Tsvetaeva Apple pie at 180ºC/350ºF/gas 4 for about 50 minutes. Especially delicious it is when it's cold. Enjoy your tea!